This map is a reissue of a map published in 1771 by John Bowles. Bowles's name has been replaced by that of Robert Wilkinson, the reissuer. 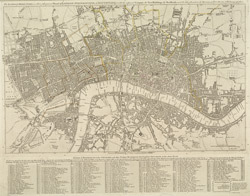 A table of references to churches and public buildings appears below the map. The built-up area of the city is stippled, with other built-up areas done in crosshatching. Coloured lines delineate individual city wards.